When the game is on the line and a championship is at stake, who is your guy? There’s always a star athlete you want to pass the ball to in the end zone or the go-to-guy taking the final shot in the dying seconds of a game. Those are the athletes sports fans around the world continue to idolize. Whether it’s two-time Stanley Cup champion Sidney Crosby or three-time NBA champion LeBron James, superstar athletes are paid to perform at a high level. Crosby — still the best player in the NHL — helped the Pittsburgh Penguins capture a pair of titles. The first came in 2009 when the club beat the Detroit Red Wings in seven games to claim the title. While Evgeni Malkin won the Conn Smythe Trophy as playoff MVP, it was Crosby’s performance throughout the post-season that lifted the Pens to the Cup. Sid The Kid finished with 15 goals and 31 points in 24 playoff games — his best post-season performance to this day. Crosby won his second Stanley Cup in 2016 when many hockey experts hadn’t put the Penguins in considering for a title. Crosby once against displayed his dominance, putting up 19 points in 24 games. While Crosby is an obvious effective player on the ice, his play off of it has been just as impactful. In 2009, the Penguins’ captain created the Sidney Crosby Foundation — an organization committed to providing support to charities benefiting children. This is juse one example of a prolific athlete fans admier, adore and lionize and we'll be profiling a variety of acclaimed superstars in our latest video series, entitled, "The Guy". In episode 1 of The Guy, we touch on Brady’s remarkable career and some of the two-time NFL Most Valuable Player’s greatest achievements. It's as motivating as it is inspiring so sit back and enjoy learning more about one of the world's greatest sportsman of all time. 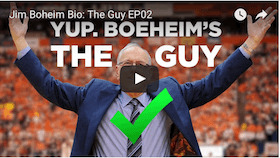 In episode 2 of The Guy, we delve into Jim Boheim's remarkable NCAA coaching career. He has been in charge of Syracuse for more than 30 seasons and has a national championship to his name, too. in 2010, he was named the Naismith College Coach of the Year and AP Coach of Year. 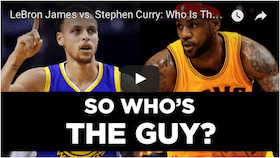 Lebron James and Stephen Curry are currently the undisputed best basketball players on the planet. But who would you rather have on your team? Totally different players, both have won the NBA Championship along with individual MVP honors. So, who is your guy? 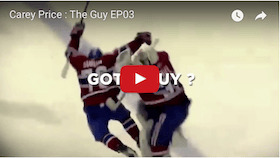 In episode 3 of The Guy, we take a look at Montreal Canadiens netminder Carey Price's heroics. Price gives the Habs, an otherwise mediocre team, a chance to win every night. He's won everything there is to win other than a Stanley Cup. That's why he's The Guy. Who would you rather have on your team, Cristiano Ronaldo or Lionel Messi? 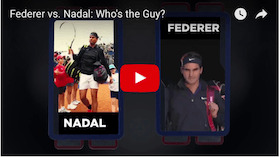 We dive into the polarizing subject in our latest episdoe of Who's the Guy. Both have the right to their claim at being the best footballer in the world. Brad Marchand is a spitfire who causes all sorts of problems for the opposing defense. A thorn in their side, Marchand has the skill and talent to back up his pugnacious demeanor. 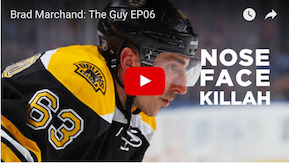 We detail how much Marchand means to his team in this The Guy episode. Clarke MacArthur, who plays for Ottawa Senators in the NHL, has repeatedlly defied the odds after suffering numerous concussions in quick succession. His story is one of resileince, inspiration and offers hope to anyone facing tumult in their lives. So, who's better, Dustin Johnson or Rory McIlroy? It's a loaded question, one that polarizes opinion. We delve into the career of the two superstars, compare and contrast their styles and offer our opinion on who has the current edge. The all-time best rivalry in tennis has to be Rafael Nadal and Roger Federer. These two have transcended tennis since they entered the scene almost two decades ago. While Nadal has the edge in the head-to-head series, Federer has to be considered the best ever tennis player. Mike Trout, nicknamed The Millville Meteor, plays for the Los Angeles Angels of Anaheim and is one of baseball's showcase players. 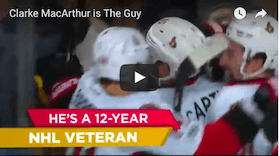 He's an absolute star and is the focus of our latest The Guy segment. Let's take a look at why he is touted so highly and find out who good he could get. Sidney Crosby not your guy? Maybe it's LeBron James, another player idolized by millions around the globe. On the court, James is already being touted as one of the best players of all time — ranking with the likes of all-time greats such as Michael Jordan, Magic Johnson and Kobe Bryant. King James’ resume is quite extensive and includes three NBA titles, four MVP awards and 13 all-star nods. James special ability to complete every night has made him many sports fans idol. A NBA scoring champion, James has also been named to the all-defensive first team five times during his illustrious career. But much like Crosby, James has been a role model off the court. A philanthropist, James continues to be an active supporter of the Boys & Girls Club of America — a national organization of local chapters, which provide after-school programs for young people. 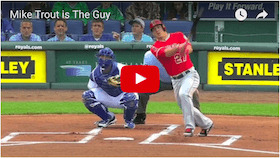 There’s been some question surrounding who the face of Major League Baseball has been over the years, but it’s hard to argue with what Los Angeles Angels outfielder Mike Trout has done for the game, both on and off the ball diamond. A two-time American League most valuable player, Trout continues to be one of the most compelling baseball players in the Big Leagues. Trout had an incredible 2016 season, hammering 29 home runs and 100 RBIs while hitting for a .315 average. On top of that, the five-time all-star has partnered with Big Brothers Big Sisters Orange County, which is a charitable youth program. As bettors, putting your money on professional sports’ all-stars and the teams they lead will put you in position to succeed on your daily and weekly picks. And that's just three of countless athletes who could qualify as your sports hero. So, who is your guy? Are you ready to place your wager on your guy? Don’t hesitate to use these leading online sportsbooks to enhance your chances of cashing in on your bets.